“I’ve never met a woman like you before…not one as funny, and clever, and silly and with such a ridiculous collection of shoes. I fell in love with you the first moment I saw you and I know now that I don’t want to go through the rest of time unless you are by my side. Amy tucker, will you marry me?” How could a story with such a fabulous marriage proposal be bad? 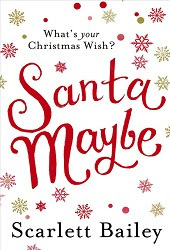 Having just finished Scarlett Bailey’s ‘Married by Christmas’ I felt I needed another hit of this fabulously fun author and so I downloaded this novella, again Christmas-themed, and settled back for just a bit more of that magical, festive optimism which is seems is synonymous with this author. Be warned, this novella is not for the cynical! It is full of fantasy and magic, and those readers with a less than active imagination might struggle to grasp the concept of a woman waking up to find Santa on the end of her bed and willingly going off into the night with him. I found what Scarlett did with the storyline refreshing. I think it is daring to write something so magical, and with such faith in a childhood fantasy for readers who would be more used to the usual romance and real-life formula normally offered by lovely authors like Bailey. I had to fully let my imagination and fantasy take over, something which can be a struggle, but I loved the idea of Santa taking Amy to see all of the places and people that she wanted to see, but also using the Dickensian trick of taking her back in time to revisit past situations and possibly mistakes.